Dolphin watching and whale watching excursions are magical experiences. Zoos, animal parks and theme parks like SeaWorld are all great places for families to learn about the animal kingdom. But there’s something special about seeing an animal in its natural habitat. 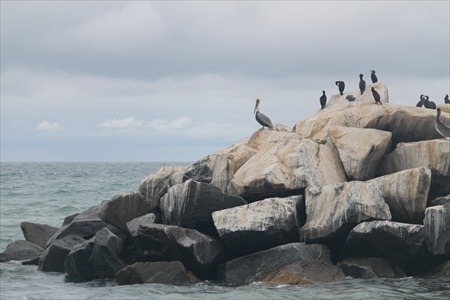 Southern California’s diverse coastline is a picturesque backdrop for a family day trip out on the ocean to see some of the most beautiful creatures on earth—dolphins and whales! My kids were beyond excited at the prospect of spotting dolphins and whales in the wild. My family ventured to the charming beach town of Dana Point, California to do just that on a chilly, drizzly October Saturday. Dana Point is situated in the southern part of Orange County between Laguna Beach and San Clemente. It has a beautiful harbor, and a fine afternoon can be spent looking at the variety of yachts, sailboats, paddleboards, kayaks and other seagoing vessels. But we had a date with some sea creatures. So we headed over to Dana Wharf Sportfishing and Whale Watching to get ready for our whale and dolphin watching excursion. For over 40 years, Dana Wharf Sportfishing has offering an array of day fishing and whale and dolphin watching trips throughout the calendar year. Our late October cruise put us in the tail end of Blue Whale season. The whole family was excited to get on board a 63-foot catamaran for the two-hour round trip. The boat was fully stocked with hot dogs, snacks, candy, wine, beer and other beverages—all reasonably priced. After a short safety briefing from the captain, we began slowly pulling out of the harbor. We took in the lovely sights of the wharf behind us, as well as the nearby wildlife as we left the harbor. Our catamaran had plenty of open seating outside, as well as a sheltered area protected by windscreens that still allowed for viewing, offering several viewing perches. Kids and adults alike gathered around and grabbed seats as we made our way towards our watching area. My 7-year-old daughter snagged the very front perch. She was absolutely delighted by the exhilarating, bumpy ride and the feel of ocean breeze in her hair as the catamaran cleared the harbor and started to gain speed. The day of our trip was the coldest in weeks, and nearly everyone aboard came a little under-dressed for the windy and slightly wet conditions. We all took turns alternating our spots on the viewing perch to the sheltered area of the catamaran as we tried to keep warm. After about 30 minutes, we were roughly seven miles from our point of departure. 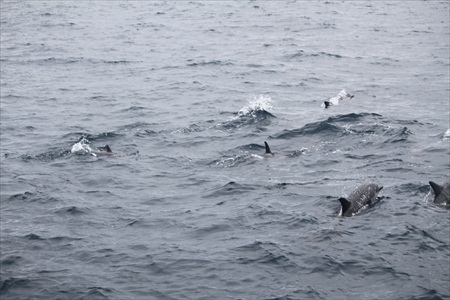 The captain announced that several other boats had spotted some dolphins in the general vicinity. Everybody rushed to the viewing perches. Out in the distance, we saw flocks of birds flying together near the water. The captain told us this often signals the presence of dolphins. 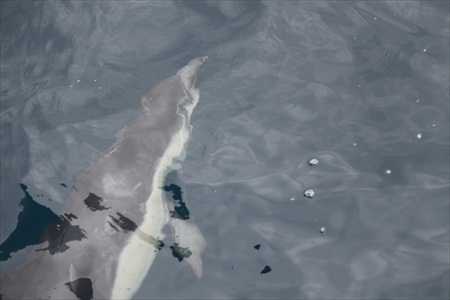 As we grew closer, we began to see a group of common dolphins swimming ahead. The kids were squealing with excitement! The catamaran continued to race toward the dolphins. In just a moment’s time, my husband, looking down at the bow, yelled, “The dolphins are right below us!” Sure enough, we had caught up with a giant group of them, and they were swimming by the dozens on all sides of the boat. From our front row perch, we were just a few feet away from these graceful and intelligent creatures. It was amazing to see them swimming, playing and almost racing with the boat, periodically coming up out of the water. They were so fast that despite my best efforts, I didn’t get many good close-ups. My best attempt at capturing a photo of a dolphin up close. The catamaran sailed along with the dolphins for about 15 minutes. 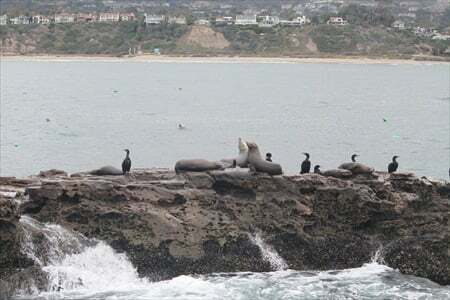 Then we finally passed them, and headed over to Seal Rock near San Clemente, where sea lions can take a break from their swimming and rest. Sadly, on this particular day, Mother Nature did not provide us with any whales to view. I recommend you prepare your children for the possibility that they may not see both whales and dolphins. There’s nothing worse than trying to soothe a disappointed and crying child on a boat with 30 other people. It was a let-down to miss these impressive creatures, but we had an enjoyable trip nonetheless. Our whole family really loved spending some time together on the beautiful Pacific Ocean and getting a glimpse of the beauty that lies beneath it. 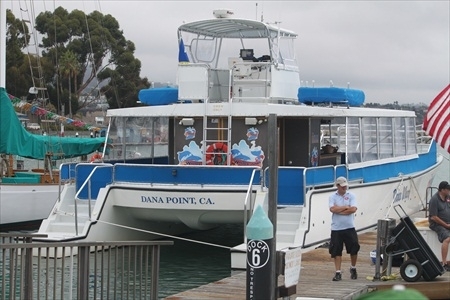 To book your own Southern California whale and dolphin watching adventure, visit Dana Wharf Sportfishing and Whale Watching. Which would you rather see in the wild, dolphins or whales? Why? Let us know in the comments! 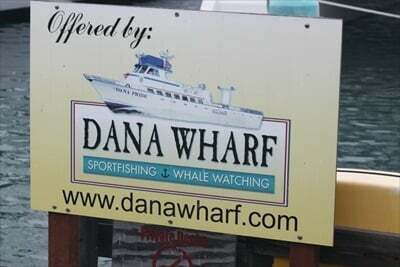 A Note from Travel Mamas: Thank you to Dana Wharf Sportfishing and Whale Watching for sponsoring our day cruise. 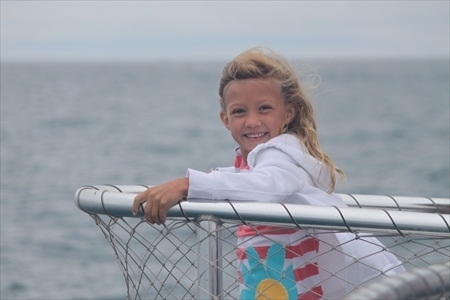 Gigi – I went whale watching years ago before I became a parent and although we saw a few humpback whales, I have to say that watching the dolphins surf the boat’s wake was much more fun! Your post reminds me of that incredible experience and has me thinking I need to book a whale watching tour to experience with my kids! I’m a SoCal mom too and took my kids whale watching this summer. Had a blast! What an amazing experience – love the excitement on your daughter’s face! We have been whale watching three times – in the Bay of Fundy, in Alaska and most recently in Newfoundland. We saw several whales on the first two trips but only saw puffins in Newfoundland. I would love to see dolphins in the wild! My family went whale/dolphin watching this fall in SoCal, too. We didn’t see any whales, but the kids were thrilled to see so many dolphins. I think as parents we forget that there is much excitement in just being out on the open ocean & seeing anything is a delight. @Debi – yes, I do think we forget that sometimes the simplest of pleasures can delight our children the most! @Lisa…wow, you have been some amazing places to whale watch. I definitely plan to do another trip so that we can try to see the real deal next time! @Lisa…where in soCA did you whale watch? Was it at Dana Wharf?